Confocal immunofluorescent analysis of HT-29 cells, mock transfected (left) or transfected with Poly(I:C) (2 μg/mL, 6 hr; right), using IRF-3 (D9J5Q) Mouse mAb (Alexa Fluor® 488 Conjugate) (green). Actin filaments were labeled with DyLight™ 554 Phalloidin #13054 (red). Blue = Hoechst 33342 #4082 (fluorescent DNA dye). IRF-3 (D9J5Q) Mouse mAb (Alexa Fluor® 488 Conjugate) recognizes endogenous levels of total IRF-3 protein. Monoclonal antibody is produced by immunizing animals with recombinant protein specific to human IRF-3 protein. 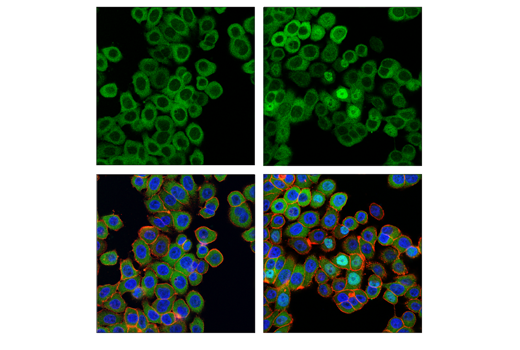 This Cell Signaling Technology antibody is conjugated to Alexa Fluor® 488 fluorescent dye and tested in-house for direct immunofluoroscent analysis in human cells. This antibody is expected to exhibit the same species cross-reactivity as the unconjugated IRF-3 (D9J5Q) Mouse mAb #10949. Interferon regulatory factors (IRFs) comprise a family of transcription factors that function within the Jak/Stat pathway to regulate interferon (IFN) and IFN-inducible gene expression in response to viral infection (1). IRFs play an important role in pathogen defense, autoimmunity, lymphocyte development, cell growth, and susceptibility to transformation. The IRF family includes nine members: IRF-1, IRF-2, IRF-9/ISGF3γ, IRF-3, IRF-4 (Pip/LSIRF/ICSAT), IRF-5, IRF-6, IRF-7, and IRF-8/ICSBP. All IRF proteins share homology in their amino-terminal DNA-binding domains. IRF family members regulate transcription through interactions with proteins that share similar DNA-binding motifs, such as IFN-stimulated response elements (ISRE), IFN consensus sequences (ICS), and IFN regulatory elements (IRF-E) (2). Taniguchi, T. et al. (2001) Annu Rev Immunol 19, 623-55. Honda, K. and Taniguchi, T. (2006) Nat Rev Immunol 6, 644-58.